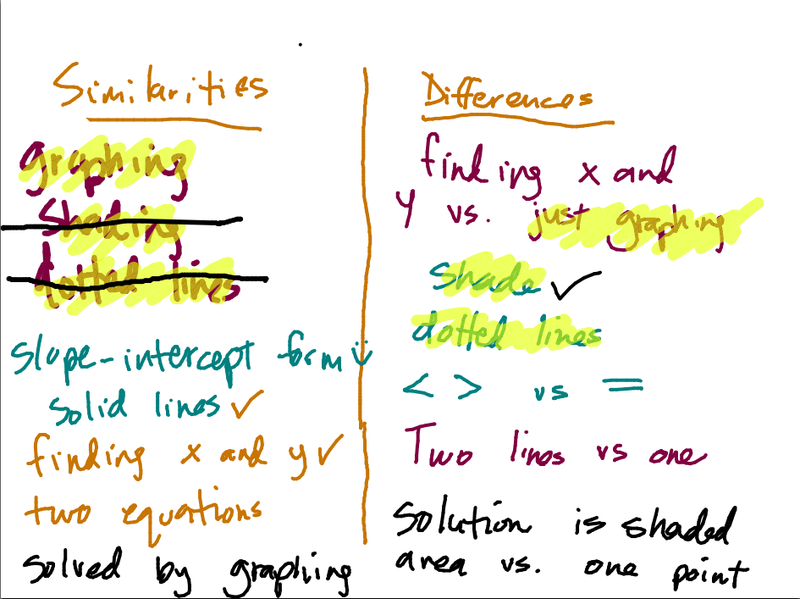 We've recently just finished solving systems of inequalities in my Algebra 2 class. Without really know what that means, its only important to know that there are many similarities between systems of inequalities and systems of equations in the manner with which you set them up to solve, and only a few distinct, but important, differences. 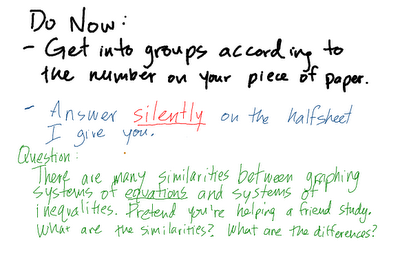 I knew several of my students felt like the inequalities was another example of the course seemingly doing something "new" every week or two, and I knew some of my students were really making the connection between the two, so I took a day to take advantage of the knowledge gap and practice some summarizing skills in small groups. This activity was loosely based on what I thought I saw as a Marzano high-yield strategy called "Chalk Talk." I can no longer find any linked reference between "Marzano strategies" and "chalk talk," but here's a document that IS somewhat similar in explanation from The League of Professional Schools. This would have been Day 2, but I had not previously reviewed graphing linear inequalities yet in this course (where it was supposed to be in Chapter 2), so I tacked on a day here in Chapter 3 because I always felt like I was reteaching them anyway. Students came in, took out what was supposed to be their homework from the night before on systems of inequalities, and I played this video in which I'd worked out some solutions. A couple of hours I just let the video play and allowed some talking amongst the kids about things they were noticing while I took care of administrative things, a couple hours I stopped it every once in awhile and had kids respond with what the next step would be. Because this was the first time trying it out, I didn't want to invest too much technology-time getting the kids set up, so I did this step with Post-Its. Accomplishing this step with each group in a Google Doc would be simple as well. There were two things I loved about this activity. I randomly distributed the group numbers around the room, forcing at least half of the class to move in order to sit with their numbers, and many students who had never worked together shared wonderfully together. It disappointed me that I hadn't switched them up sooner. Secondly, the last, summarizing step was a happy accident of scaffolding. Some of the groups basically regurgitated back a list of things they had all compiled, and some groups' writers spent several minutes writing wonderful paragraphs and being very thoughtful about using descriptive, math vocabulary. As the groups read, I put things I was hearing up on the SMARTboard. You'll probably notice that a few things would up on both sides of the chart - a confusion I wasn't even aware of. 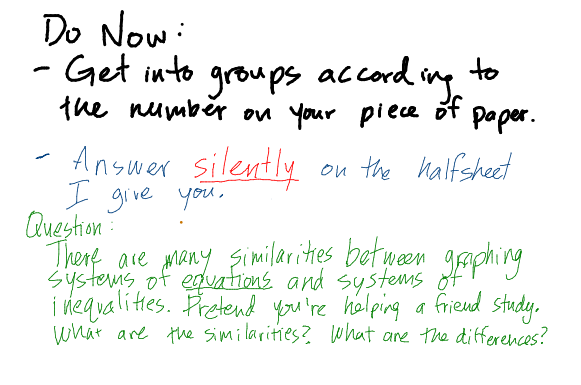 It was helpful for me to see that and for the group that put it (incorrectly) on the similarities side to have the uh-oh moment after the other groups put it as a difference. This could serve as an introduction to systems of inequalities with a webquest, book reading assignment, or video completed prior to the post-it note silent writing time.